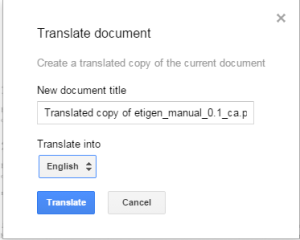 You can upload your PDF to Google Drive, convert it to Google Docs (open with Docs), and apply tool Translate to... English. It will make a copy of the PDF in editable format and also keep the original. Click on NEW > File Upload, select the file from your computer.. 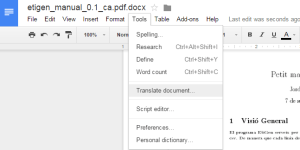 Translated document will open in another tab, which you can edit, print or download to your computer. Some eBook reader apps are able to translate for you on the fly (I know of two, Google Books and Cool Reader. A better list is in Wikipedia features table). Please note that this translation isn't guaranteed to be very good, and language support differs between readers as well. If you need a professional quality level translation, (as you seem to imply when you mark the book as important), I think that your only option is to hire someone who has knowledge of both languages that can do the work for you. By using any online or computerized service you can't have any guarantee about the quality of the translation. You can use http://translation-embedder.com which enables you to upload a PDF and get a generated HTML e book. This e book can be opened in any browser - best to use is Google's Chrome. In this new book when you click on the word you will get instant translation and also text to speech capability - this can be turned off. You can view this new HTML e book off line without Internet connection. Application is free to use.You can also read your E book on any mobile phone browser. How do I crop out an image from a pdf file? How to convert scanned pdf to text?